So, now that I've discovered some new ways to make muddy buddies/puppy chow, thanks to Your Cup of Cake (see Butterfinger Muddy Buddies post), I've made up another version: Toffee Almond Muddy Buddies. It just makes sense. I can't even tell you how I arrived here, but I must say that I really like these, and if I hadn't already eaten so much of the Butterfinger version, I would probably be munching on this right now. Thankfully, I can resist for the time being. We have guests coming for dinner tonight, and I'm hoping they'll put a good dent in the bag of muddy buddies in the fridge. (This house is too hot to let them sit out, but they probably don't need to be refrigerated if you can keep your house below 75 degrees.) I got the cocoa almond spread at Trader Joe's, but if you can't find that, I think Nutella would work too. I just wouldn't use peanut butter because I think it would overpower the toffee. These are light, crisp, and sweet--but not too sweet. I think it's a nice light way to enjoy some English toffee. Line two cookie sheets with wax paper. Set aside. Pour the Rice Chex into a large bowl. In a microwave proof container, melt the chocolate chips with the cocoa almond spread (or Nutella) in the microwave until almost melted (I put it on high for 40 seconds). Stir until chips are completely melted. Pour chocolate over the Chex and stir/fold gently with a silicone/rubber spatula until Chex are completely coated. Pour coated Chex into another large bowl with a lid or into a large bag that can withstand some shaking. Pour in the almond and toffee bits. 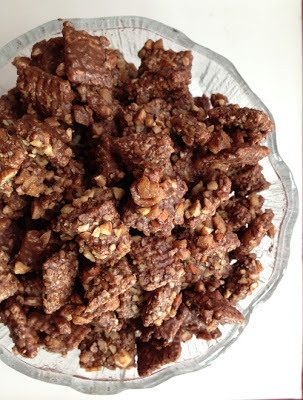 Cover bowl or close bag tightly and shake and toss until almonds and toffee are evenly distributed and sticking to the Chex. Pour muddy buddies onto the prepared cookies sheets and spread them out into a single layer as much as possible. Put in refrigerator until chocolate is set, about 30 minutes. Move to an airtight container and store in the refrigerator if the weather is to warm to allow chocolate to remain set.